. 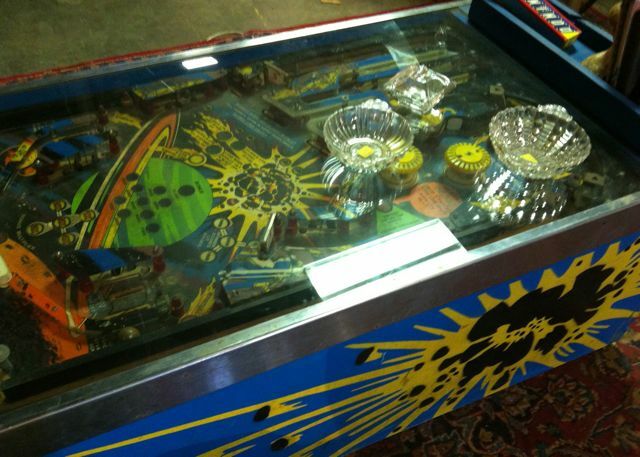 . . the intricate workings of an old pinball machine, minus its legs—a funky coffee table, maybe? Plus the glass bowls with their yellow price stickers (inside) set on top, and their reflections going inside . . . This was a lucky find, lucky shot. Thanks! Clever twist on the prompt. I really like it! I haven’t posted my photo yet – can’t find one that fit the bill! That’s happened to me a couple of times lately. I always enjoy your photos, though; you come up with such interesting ones! They are! I saw this one at an amazing flea market–lots of terrific old finds and photo ops. Thanks, Veronica.